Locate and defeat the creator of the Llodos Plague. The Llodos plague has been unleashed and it's spreading through the gorge. Despite this, some Hlaalu guards are searching for the Maulborn alchemist. Defeat the enemies inside the alchemist's lair. Varon is worried about Captain Diiril, and asks you to find him. the captain ran across the gorge with several of his troops. Follow in his footsteps, up the stairs of the Daedric Ruin on the other side of the ridge. Diiril is amazed at how you can run past the sick and not succumb to the plague. He says the Maulborn are retreating, and asks for your help capturing Merdyndril, the alchemist who created the plague. Captain Diiril also wants you to help him find something that will allow House Hlaalu to devise a cure for the Llodos Plague. Enter the alchemist's lair and search forclues as to how the plague was created. On a table in the middle of the apothecarium, there's a recipe for the Llodos plague. 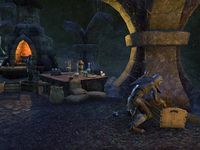 Diiril exclaims that you've found exactly what House Hlaalu needs to produce a cure for the Llodos plague. Before you have the chance to celebrate, the two Hlaalu guards that followed you in turn into plague zombies in a puff of green smoke. As it turns out, the alchemist that created the plague, Merdyndril, was hiding in this cave, and has released the plague into the room. Diiril helps you defeat the transformed guards, then turns into a zombie himself after Merdyndril exposes the two of you to a stronger version of the plague. Kill Captain Diiril, and Merdyndril approaches, having entered the room from a trapdoor in the back of the cave. Merdyndril: "You didn't think it would be that easy, did you?" Kill Merdyndril, then exit the apothecarium and find a Hlaalu officer to give your evidence to. Scout Mamyne and Varon Davel are outside. Scout Mamyne says they will be able to make a cure for the plague with the alchemist's notes, and gives you a reward for your help in the gorge. Completing this quest earns you the achievement Plague Ender. I need to find Diiril. He was last seen leading troops toward the southern part of the Gorge. Luckily, I seem to be immune to the plague. Diiril and a few of his troops are still alive. I should talk to him. Diiril located the alchemist who created the Llodos plague. We're going in to find out how the plague was made so House Hlaalu can produce a cure. We discovered an apothecarium within the ruins. This is where the plague was created. We should search the area for any clues that will help us. We found the recipe for the Llodos plague, but we also walked into a trap. Merdyndril, the alchemist who created the plague, was waiting for us. I have to deal with the transformed guards before I can kill Merdyndril. I killed Merdyndril, the creator of the Llodos plague. Unfortunately, Diiril and his soldiers are dead, too. I need to let House Hlaalu know what I found. Finishes quest I killed Merdyndril, the creator of the Llodos plague. Unfortunately, Diiril and his soldiers are dead, too. I need to let House Hlaalu know what I found. This page was last modified on 14 April 2019, at 02:32.